Unlike local chains at the time that were mainly collections of existing shops, Safeway built their own stores. Under the leadership of Safeway Canada president Lon W. Raley and their local builder W. J. Latley they wasted no time starting their building spree. Safeway set up their head offices at 313 Pacific Avenue. and in July took out a building permit for a bakery / factory at 283 Chambers (off Logan). Construction began on their first eight stores in June 1929 and they took out permits for another eight the following month. Under the bland motto (by today's standards, anyway) 'Distribution Without Waste', the first Safeway stores opened on October 18, 1929. It's likely that these were the first Safeway stores to open in Canada, though the chain was working on stores in Vancouver at the same time. The buildings were 32 x 80 feet, identical in appearance inside and out and cost $12,000 each. They featured an orange and black colour scheme. The most distinctive architectural feature is the roof line, finished in a Spanish terra-cotta style bookmarked by two decorative peaks that display the Safeway shield. There are a number of old convenience stores in Winnipeg that weren't built by Safeway but have a similar roofline. It's impossible to tell if Safeway used elements that were already common for retail stores at the time or if other store owners were "inspired" by Safeway. It seems in some cases, at least, Safeway retrofitted stores that it inherited for a short time through mergers until they decided which stores to rebuild and which ones to sell off. The way to tell a corporate-built Safeway store versus an "imitation" store is the height. Safeway stores were split level. The front of the store was a single storey hall but at the back, over the stock room and meat cooler, was a second level that housed the manager's office. Another unique Safeway store feature is the way it owned its buildings. Once they bought the land and built the store, they sold it to a thrid-party landowner who then leased it back to them for a period of 20 - 25 years. This allowed the company flexibility when it came to future relocation or infrastructure improvements. Corporate takeovers were important to Safeway's growth and they started early in the Winnipeg market. MacMarr began to reopen their 32 newly renovated and re-branded Mutual Stores on May 18, 1929. In December of the same year they sold the chain to Safeway, (see part 1 for more on the MacMarr / Safeway relationship). 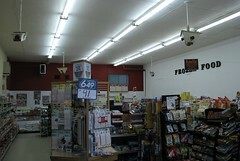 Most Mutual Stores initially stayed under the Mutual banner and advertising indicated that Safeway prices and Mutual prices were the same. Soon after, Macdonald's Consolidated also became a wholly owned subsidiary of the grocer. By the start of 1930, after just six months, Safeway had doubled its retail presence and had warehouse and distribution facilities throughout Western Canada. Despite the stock market crash of 1930, Safeway continued to grow. It acknowledged in an ad that 1930 had been a tough year but that the worst was behind. By 1931-32 there were more stores added. For a map of the 1930-1932 stores. There was similar activity going on around Western Canada in cities big and small. Little mention was made of stores outside of Winnipeg. Their first appears to be a $5,000 store for Deloraine, Manitoba announced in July 1929. Neepawa (above - source) also got a store that same year. By 1932 Brandon had two Safeways at 160-10th St. and 630 Rosser as well as a district manager's office on 11th. Below is a ca. 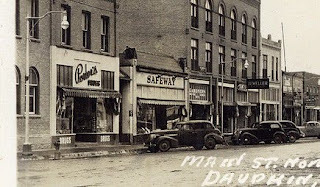 1940 image from Dauphin with a 1929 style Safeway (source). Stores were opening across the West including large centres such as Edmonton with 10 outlets in 1929 and towns as small as Wetaskiwin. Safeway kept the Mutual Stores name and pared the chain from 32 stores down to 8: 440 Academy Road; 843 Ellice; 553 Notre Dame; 544 Rosedale; 913 Sargent; 229 St. Mary's Rd; 892 St. Mary's Rd; 877 Westminster (see map). Mutual Stores advertising virtually ceased as Safeway ads became dual "Safeway and Mutual Stores" ads. The acquisitions did not stop there. In 1936 Safeway took over Piggly Wiggly (Canadian Ltd) which had 22 Winnipeg locations and owned a dairy facility called Crecent Creamery on Owena Street. Prior to coming to Canada, Safeway had already assumed control over PW's Western U.S. stores. By 1939 Mutual Stores was dropped by Safeway and it appears that the stores were sold off as independent grocers. Piggly Wiggly became the new Safeway partner. The merging of head offices and manufacturing facilities took place quickly but for a period of three years all 22 Piggly Wiggly locations remained open. This led to a few cases of Safeway and Piggly Wiggly having stores right next door to each other, such as: 1411 and 1413 Main; 243 and 247 Lilac; 221 and 227 Kelvin (now Henderson Hwy). For a map of the Piggly Wiggly locations. The level of concentration Safeway had in the production, distribution and retailing of groceries in Winnipeg did not come without some trouble. On separate occasions in the late 1930s Safeway was called on the carpet by regulators for allegedly influencing the sale price of both bread and milk. Safeway denied the allegations and charges were never pursued. As the 1930s came to a close it was time to concentrate again on their Safeway branded stores. Good job on the research! You certainly go the extra mile in digging for facts when preparing your posts. It's certainly a timely post, given the likelihood that the development of Wal-Mart's "Supercentres" will mean big changes in this industry locally. There's two more parts to go ! 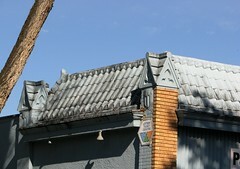 Yes, though, the style (with the slate-looking tile roof overhang and mini 'turrets') was very popular. Whether Safeway just capitalized on something already in-vogue for stores OR they set the trend and others micmicked it I'm not sure. I've seen dozens of little shops in West Broadway, West End etc. with that sort of roofline that turn out weren't Safeways. The one distinctive feature for the chain was that their stores were the taller ones as there was a managers office on a second floor at the very back of the store. I took a pic of the interior of the Pals on St. Matthews showing the office at the back which I will insert somewhere. There was also a Safeway at St. Mary's and St. Vital Road in the 1940s. The building is still there.